The answer? – When you know (or can estimate) the distance to your target. If you’re taking a Hunter Safety course, you might well be faced with this question. Based on what our research in tells us, between 100-1000 people are searching for this term every month… the fact that so many don’t seem to know the answer is surprising. It may be down to the wording of the question, or it could be that many people assume aiming a bow at up-to 70 yards is the same as aiming a gun (it isn’t). This short piece is going to introduce you to the bow sight, the different types, how they work, and crucially… when bowsights work best! If you want more, there’s a more comprehensive guide on our roundup of the​​​​​ best sights. Bow sights are circular rectiles fitted to the front of a bow that contain either 1, 3, 5 or 7 pins. Each pin will correspond to a known distance to target. 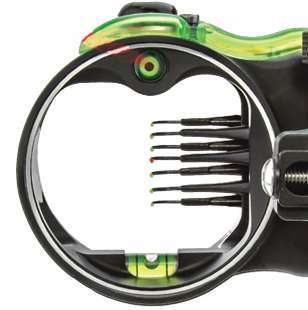 The idea with these sights is that they are fitted to your bow and you are responsible for understanding and setting them so that you know the distances to target that each pin represents. For example you’d probably ‘sight-in’ a 5-pin sight by first aiming at very short range target (say 10 yards) using that pin and adjusting until it was correctly positioned. You’d then move onto the remaining pins and adjust them so that they were accurate on or around your maximum and preferred shooting ranges, i.e. So with a sight setup like this you have a pin to choose from (to aim with) that represents a good spectrum of your effective shooting range. All you’d need to know then is the distance to your target and you can pick the correct pin to aim with so you’re set for an accurate shot. If you don’t know (or can’t estimate) the distance to target, the pins become largely useless. There’s a variation on the fixed pin bow sight that some people prefer called the single-pin. Single pin sights are easily adjustable out in the field, whereas adjusting the pins on a multi-pin bow sight is normally a fiddly job that requires loosening an adjustment screw. That’s not something you want to be doing whilst hunting. On a single pin, you set and test the sight at particular distances during practice and you then know from markings on an adjustment knob how far to adjust the dial to change the effective pin range. You can adjust the single pin-sight easily in the field. Again though… this is only useful if you know the target distance! Whether it’s from kids toys, the shooting range or playing first person shooter games on the computer, pretty much everyone is familiar with sighting a gun at short range. You look down the iron sight, align it with the target and bingo, you’re set. Snipers and long distance rifle shooters however have to deal with the fact that over long distances the bullet drops during flight, the longer the distance the more pronounced the drop and the more adjustment needed in the aim. I wonder how much the bullet in this 3,540m shot dropped? Compared to a gun a bow is a low powered weapon with a large bullet. Shooting a bow at relatively short ranges (upto 70m) is similar to shooting a gun at very long range. You need to take into account the drop of the arrow and adjust the aim accordingly. 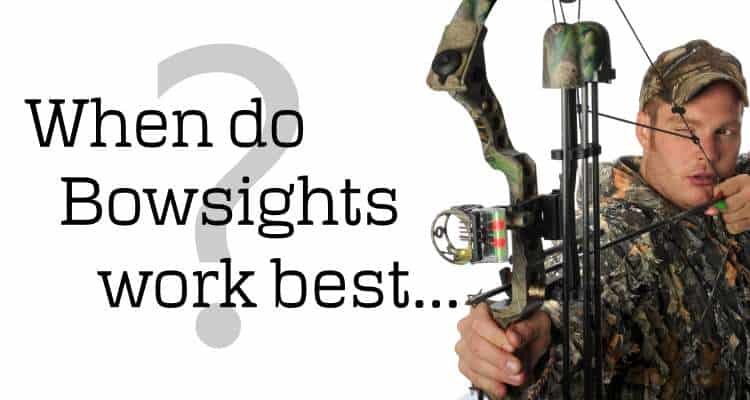 Because most of us are introduced to sights at a young age by way of aiming a short range gun, there’s little doubt some don’t think there’s a need to change that thinking before they ever pick-up a bow. So you know now that to use a bow sight effectively you need to know how far away the target is…. There’s a few ways you can ascertain that distance. You either use a rangefinder or you learn to judge the distance yourself and judging distance comes down to practice. If you’re hunting electronic bow mounted rangefinders aren’t legal in all states for all types of game, you’re best to check before you rush out and get one. Here’s a great video with Phil Mendoza that takes you through the basics of how to judge distance using a technique called ground judging. Even if you can judge the distance expertly and pick the correct pin or pin adjustment on your sight, when you’re hunting there are situations when your prey may be a fast moving target. Not a sedate walking pace, fast, the pace of an animal that’s bolting. It’s pretty difficult to close one eye and align a pin on prey moving like that. Time to throw away the bow sight and aim instinctively. Instinctive aiming is exactly that, no sight, just the line you make yourself from the tip of the arrow to the target. For fast moving targets having both eyes open when you shoot greatly helps your subconscious to judge speed and track your aim. Some people always shoot instinctively. If you’re good at it, you’re a more natural and effective hunter in any situation and there’s a thrill that comes from knowing that hitting the target dead-on came entirely from your judgement.